To be brutally frank, as castles go the ruins of the one at Kenfig do not amount to much. That said however, it is doubtful whether there is another fortress in Britain that can boast such a record of service. There is clear evidence of nine attacks upon it and the adjoining town, with a strong circumstantial case for at least two more. All this in a period of just 300 years! It is believed the castle was probably built about the same time as the town in the late 1140s, and that the keep and inner ward (which are the only portions visible today) were rebuilt in stone during the closing years of that century. This part of the fortress was excavated in rather haphazard fashion in the 1920's No proper report was ever made, and the ruins were left exposed to the elements hastening their subsequent deterioration. When built the castle was probably constructed entirely in timber. The inner ward, which contains the keep, is roughly 37m. in diameter and was surrounded by a deep moat, 18m across, into which the adjoining river could be diverted. Entrance to this ward was in the SW corner, and some traces are still visible of the long defended entrance passage through the curtain wall. This led out onto a drawbridge that gave access to the outer ward on the opposite side of the moat. The keep is about 14m square with walls nearly 4m thick, and originally probably stood to a height of about 17m. The builders incorporated within its fabric Roman bricks, tiles, and ‘opus signum’ (Roman concrete) a sure sign that a Roman building lies somewhere in the vicinity waiting to be re-discovered. Perhaps the most unusual feature of the castle is the size of the outer ward which has been estimated to be between 8 and 11 acres in extent. It lay to the south and west of the inner ward, and the large area it enclosed has led many to believe that it is in fact the site of Kenfig Town. The earliest town did indeed occupy much of this enclosure, but by 1154 had been moved outside to the south. As in other castles this outer enclosure would have contained the living quarters of the constable and his garrison, stables, and possibly a chapel. Once the town moved it would have been far larger than these purely domestic needs would have required even though some houses belonging to the burgesses did remain. Probably it was retained for use as a forward base for military forces engaged in operations further west where much of the local unrest during the12th and 13th centuries originated. 1167	The first recorded attack by the Welsh who burned the town. 1183-4 A Welsh attack upon the town destroyed part of its defenses and the town mill. Severe damage was sustained by the castle and timber for its repair had to be brought from Chepstow. The chronicler of Margam Abbey, who mentions this attack states that it was the second in just over twelve months. Hywel ap Maredudd of Miskin (the area about Llantrisant) attacked and burnt the town. An attack by Morgan Gam of Avan (Aberavon) carried the town and most of the castle outworks, but was thwarted when the garrison made a successful last-ditch stand in the keep. Hywel ap Maredudd again attacked and burned the town. 1262? Widespread destruction in the vicinity of Kenfig during a Welsh uprising is listed in a survey of Glamorgan made at this time, but which does not include details for Kenfig Borough. It is, however unlikely to have escaped unscathed. 1295 The local Welsh under a leader known only as ‘Morgan’ destroyed the town and burned part of the castle. Morgan of Avan led a short-lived local rebellion at this time, but it is not known if Kenfig was attacked. 1316 A large area of the town was destroyed during the rebellion of Llewelyn Bren, 42 burgages being left in ashes. 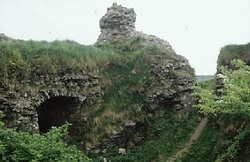 Damage was caused to the castle which was nevertheless held. A coalition of local Welsh and baron in rebellion against the crown devastated the town and capturing and destroying the castle and part of the town. Local legend has it that the castle was attacked and destroyed by Owain Glyndwr. There is however no evidence to support this claim which is widely made for most ruined castles in Wales!